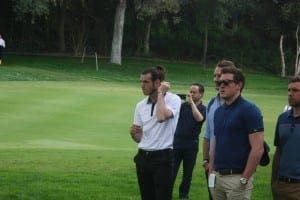 GARETH Bale was at Valderrama on Sunday for the Open de Espana a day after starring in Real Madrid’s 5-1 rout of Getafe. The Welsh wizard was on hand to cheer on his friend Sergio Garcia, who had a storming day four to finish the weekend three over par. Bale, who recently had a three-hole course installed in his garden, is a keen golfer with an impressive six handicap. Real Madrid are one point behind La Liga leaders Barcelona ahead of the Catalan side’s match against Valencia tonight.